German Patrick Dickmann is known for his Modern prowess. Dickmann brought a 75.4% Modern win percentage into this weekend, the best of anyone here at Pro Tour Oath of the Gatewatch. Impressively, Dickmann managed to improve on that number. 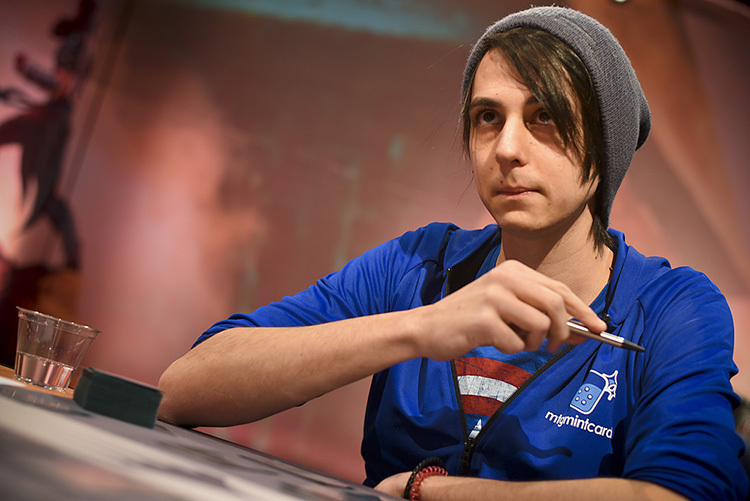 This is Dickmann's second Pro Tour Top 8; the young German is quickly building a resume as he establishes himself as the penultimate Modern Master. A win this weekend would probably lock up captainship of the German national team. 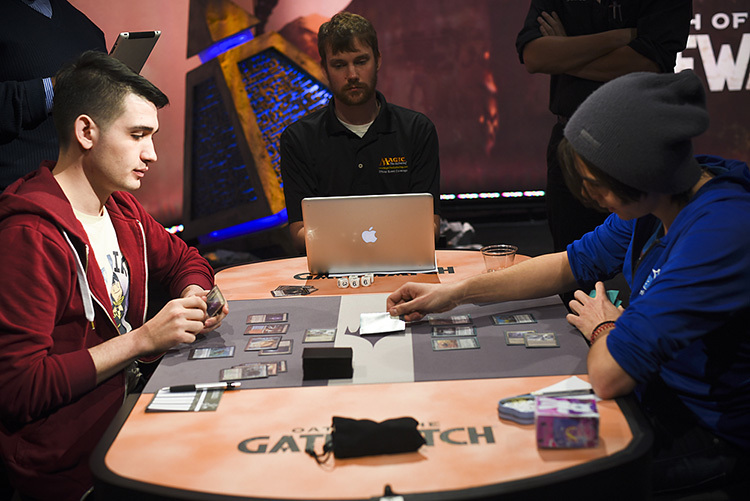 His opponent, Californian Andrew Brown, is competing in his first Pro Tour Top 8. Brown brings a confidence to the table that's hard to deny. His Blue-Red Eldrazi deck is tailor-made for this Top 8 where it can punish Affinity in post-boarded games with Hurkyl's Recall and break serve in a pinch against other Eldrazi strategies with Eldrazi Obligator. With five game matches, Brown will have more chances to draw Hurkyl's Recall in post-sideboarded games. Brown's team, East West Bowl, is quickly making a name for itself after a stellar Grand Prix performance last weekend and absolute dominance through this weekend's Constructed rounds. Dickmann tried to joke with Brown a bit before the match. "We were going to test your deck, but we didn't have enough draft commons to put it together," he said. Brown was unphased. "I'm just happy to be here," he continued. I won some games yesterday that I had no business winning. I even had an opponent cast Shatterstorm, leaving me with no cards in hand and nothing but three Darksteel Citadel in play. I won that game." Andrew Brown was playing his team's talk of the tournament: Blue-Red Eldrazi. However, he faced a difficult opponent in Patrick Dickmann, renowned for his skill and his love of Modern. It was an exciting story, but Brown was more interested in the task at hand. In the first game, Brown got things started quickly with Eldrazi Mimic on the first turn. Dickmann, howveer, had an explosive draw where he was able to unload Memnite, Ornithopter, Mox Opal, and Cranial Plating on the first turn. Brown only had Vile Aggregate to follow. It seemed like the newcomer could find himself dead in short order against the German's blisteringly fast draw. Dickmann had Signal Pest, suited up his Ornithopter with Cranial Plating, and smashed his way into combat for 5 damage! Brown had Thought-Knot Seer, but Dickmann had moved his Cranial Plating and he was able to trade with Eldrazi Mimic when Brown sent his team in for a damage race. Master of Etherium came off the top of Dickmann's deck, and he started to do the math of how much damage he was attacking for. "It's eight," Brown said plainly. Eldrazi Skyspawner could play reasonable defense, but Dickmann's next attack was too much and the pair would be moving on to a second game. Post-sideboarded games could be quite a bit different. Brown had three copies of Hurkyl's Recall that could give him the tempo swing necessary to turn the tides of battle. "That's about how I imagined Game 1 would go," said Brown. Dickmann agreed. "Yeah, Game 1 can be like that," he replied. Now here comes the Hurkyl's Recall." "These life pads don't have game 5 on them," mused Brown. Dickmann smiled. "You'll notice the life pads don't have a Game 4 either. The writing is on the wall." In the second game, Brown got things started with Eldrazi Mimic again. He heated things up with Eldrazi Obligator and got in for 6 damage, but Dickmann had Whipflare and was able to kill two of Brown's threats for a single 2-mana card. Dickmann's experience and preparation with Affinity ensured he was strongly positioned against this weekend's field. Brown tried to recoup with Ruination Guide, and Dickmann couldn't find any aggression as he played out Spellskite, which was actually a somewhat impressive blocker given the composition of Brown's deck. Next came Steel Overseer, and Brown decided to pull the trigger with Hurkyl's Recall. It left Dickmann with nothing on the table, but a Dismember for Ruination Guide meant that Brown wouldn't be able to capitalize on this huge tempo advance and Dickmann could simply replay the threats in his hand to get back into the game. Brown continued to draw land and couldn't find a threat to put pressure on Dickmann, whose board was steadily growing with Steel Overseer, Master of Etherium, and Ornithopter. Signal Pest and Arcbound Ravager came down, letting Dickmann get in for a massive attack. Brown had another Hurkyl's Recall, but he had already taken a ton of damage. Still, with no way to pressure Dickmann's life total, things started to look grim for Brown despite his ability to draw a pair of his exceptionally strong sideboard card. Brown only had a Chalice of the Void, which he played for one. Dickmann unloaded Steel Overseer with a pair of Ornithopter from his hand. Finally, Brown was able to find Reality Smasher and try to turn the tides of battle. Brown wasn't down for the count, and pressed on. Dickmann wasn't going to be playing around the third copy of Hurkyl's Recall, and he decided to sacrifice a slew of artifacts to his Arcbound Ravager to get in for lethal damage, and it looked as if his prediction of a three-game victory wasn't too farfetched. Dickmann kept his opening hand, and Brown went looking for a six that could stand a chance against the robotic assault that he was facing from the other side of the table. Brown had Chalice of the Void for zero on the first turn, and followed it up with a Chalice of the Void for one on the following. Suddenly, a significant portion of Dickmann's deck had been rendered useless. Dickmann kept coming though, and had Arcbound Ravager and Vault Skirge that could get onto the table despite the pair of Chalices from Brown. Brown hadn't found a third land and he had to sit and wait, hoping that his pair of Chalice of the Void would provide enough defensive measures to help him survive until he drew the requisite land to play out his threats. Another Vault Skirge came down for Dickmann, and Brown felt it was necessary to spend a copy of dismember to help slow the bleeding. With a pair of Reality Smashers in hand, it was only a matter of time before Brown drew the land he needed to turn the tables. Eye of Ugin came off the top, and Brown was able to cast Eldrazi Skyspawner and Vile Aggregate on the same turn, each for just a single mana thanks to the power of Eye of Ugin alongside 3-mana Eldrazi cards. It was too late. 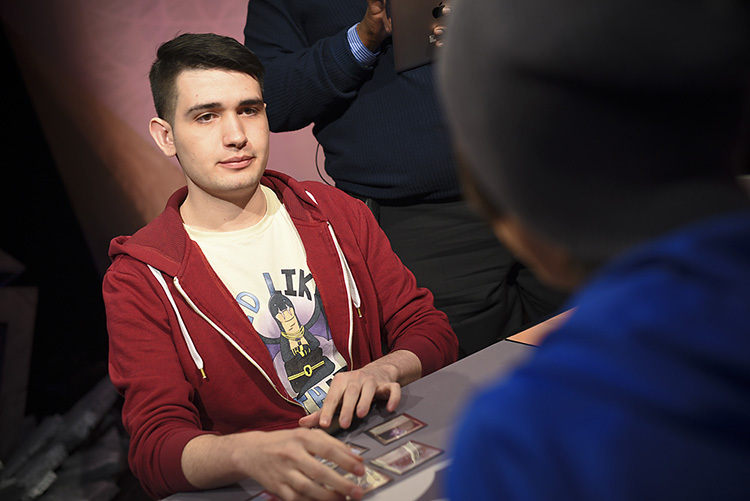 Dickmann was able to unload enough artifacts from his hand to force through lethal damage with Arcbound Ravager trickery, and the Modern master from Germany had, once again, secured himself a spot in the semifinals of a Pro Tour. Brown had some bad luck, but he handled himself with poise and optimism despite the circumstances. "It's okay," he said. "I'm Gold now. I guess I'll see you in Madrid. Hopefully on Sunday. Good luck in the semis." Patrick Dickmann defeats Andrew Brown 3-0 and advances to the semifinals!